In case you can't tell, I'm a real tea card fan. My favorite cards are the dinos and since I come from the US, I think the blue backed cards are better. I know, it's just a color difference. Sorry, but I still prefer them over their near identical black brethren. When the US Red Rose company started it's website in July of 2002, I was ecstatic. They seemed very interested in people who collected their premiums. They even had links posted to collector's websites and encouraged collectors to submit their own links. They did seem pretty preoccupied with the Wade premiums, but I figured I could fix that. So I sent them an email asking them to consider my site as a candidate for linking. 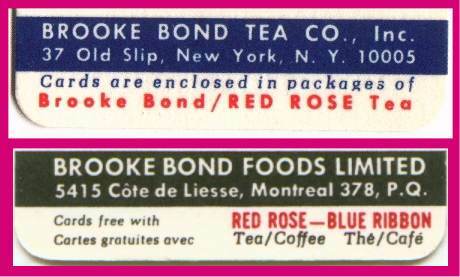 "The tea cards were only featured in the Red Rose Tea that is manufactured in Canada by the Thomas J. Lipton Company. We only distribute our products within the United States and we have always featured the Wade figurines inside boxes of our tea. Excuse me? You always featured Wades? I'm afraid you've been misinformed. "I am checking further on this." I have to admit that I can see why this is not a top priority for them but.... I couldn't wait any more. After waiting for six months I emailed Mary and told her that I planned to share this news on my website and her response was to wait just a little more while she checked on a few leads. Cool! Now we're getting somewhere! "I hope I can give you information this time that will not only end the confusion on this matter of the cards, but will also end any discrepancies, etc. that have heretofore been mentioned. First and foremost, you are really asking the WRONG company, however, we happen to know that the Unilever Company (with whom you really should be dealing with) is not always the most helpful in areas of promotions, etc. You might wonder why we are the wrong company. We license the Red Rose brand from Unilever (who own it) and have zero affiliation wth the Brooke Bond company. Please be advised that all marketing efforts were initiated in Canada. Brooke Bond USA reported to Canada (who reported to the United Kingdom). Some additional information regarding the card promotion--Most likely the "37 Old Slip" must refer to "Islip" New York, which was the correct address for Brooke Bond US. Most of the promotions run prior to 1970 were not only run in Canada, but also in the United States. However, the promotion would have certainly originated in Canada since that is where all marketing decisions were made at the time. We simply do not know any more about the promotion. 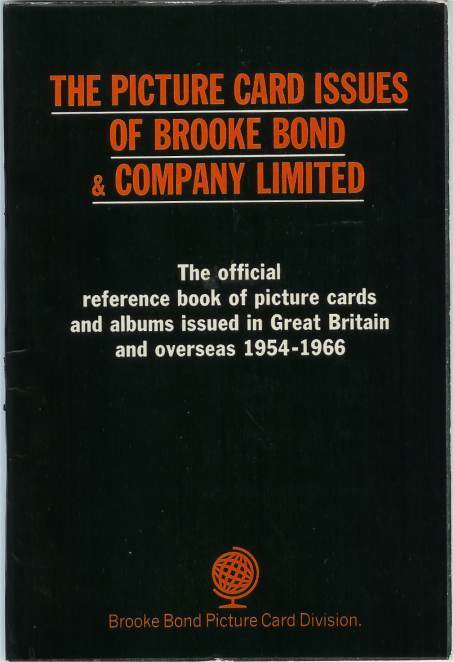 Any archived information would be with Unilever (since they bought Brooke Bond, not Redco Foods). Before the days of Redco Foods, Brooke Bond USA was really only a sales office. Some marketing functions were also added in the 1970's as Red Rose was rolled out to Florida and other markets, but all production was in Canada. Most of the executives were from England. Fortunately, our company has many links to the past, however, we do not have any of the old records. I hope this information will satisfy the matter of the cards." Does this satisfy the matter of the cards? OK, I now understand that Red Rose of the US is unaware of it's past. It was suggested I contact Unilever. My initial purpose in contacting Red Rose was to add what I feel is an informative and snazzy web site about their premiums to their links page. It has been 3 months since I got the above reply and I am pretty confident they will not be linking to my site any time soon. Sorry everyone... no recognition from the issuer. At least we know what the truth is. Oh yeah, so does Brooke Bond. They had a picture card department and annually issued a really neat booklet of the cards issued in England and the rest of the world. 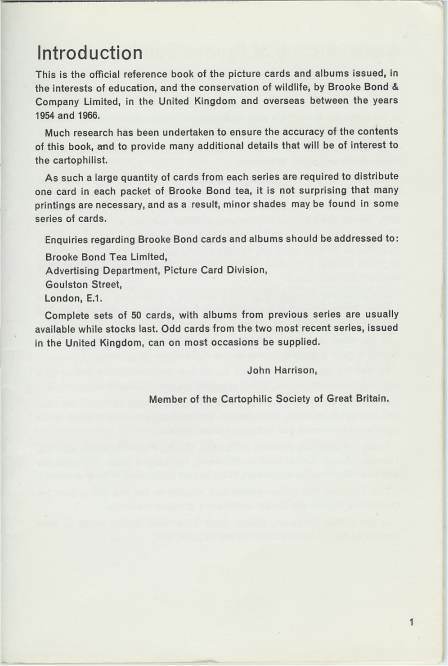 Below is the cover and introduction page from the 1966 picture card issue booklet. Note in the introduction (from the Cartophilic Society no less) that they go to great lengths to research these things. 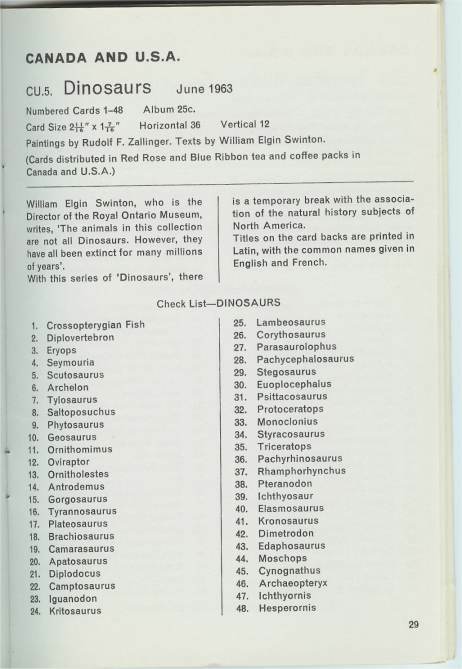 And finally, a page about my favorite issue, the dinosaurs. What does it say just above the horizontal line? "Cards distributed in Red Rose and Blue Ribbon tea and coffee packs in Canada and U.S.A."
OK, I know you already knew that Red Rose issued cards in the US, I just wanted you to feel as frustrated as I when I dealt with Red Rose. Oh yeah, you could tell them to add me as a link to their site, that would be cool. I think it would more closely reflect their history. You can contact them at Webmaster@RedRoseFigurines.Com. Good luck. After I published this page on my site, John Rigg, former President of Red Rose Canada and founder of Redco, contacted me. He said that he recalled that "they (tea cards) were discontinued in the US in the mid 70's". Thanks Mr. Rigg. I appreciate your recollections.